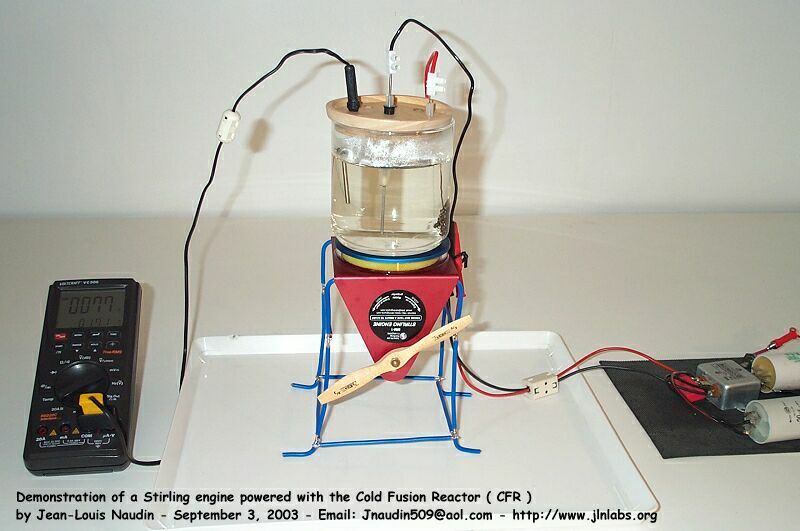 This is a demonstration of a Stirling engine powered with Cold Fusion Reactor ( CFR ). The Stirling-cycle engine has been patented in 1816 by Robert Stirling, a Scottish engineer. The Stirling-cycle engine runs on the expansion and contraction of a gas forced between separate hot and cold chambers. The resulting change in volume is then used to drive a piston, which can then be used to power external devices. 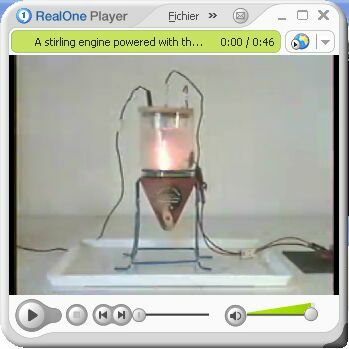 A stirling engine is very efficient. 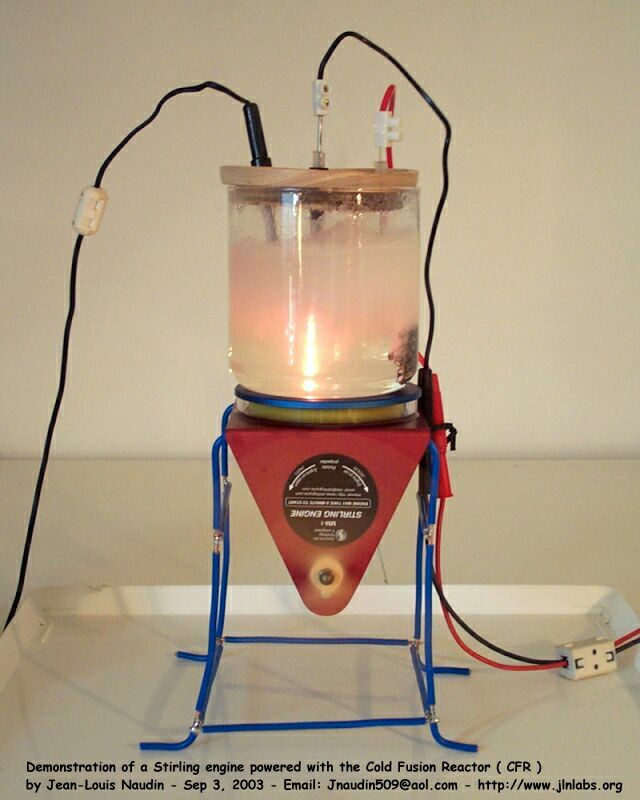 A heat pump powered by a Stirling engine can do more work than a conventional heat pump. 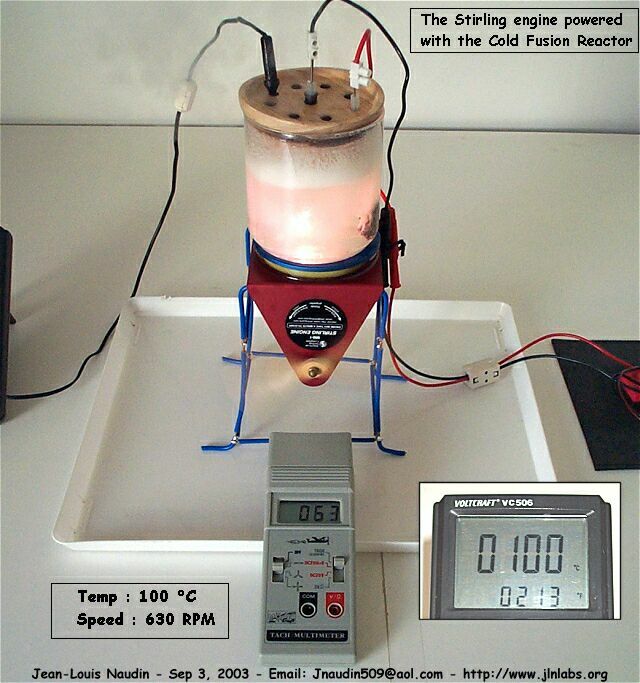 The Stirling engine can use any heat as a source for movement it only requires a heat source and a cold sink. Imagine a compact, quiet power plant that delivers some kilowatts of electricity powered by a Cold Fusion Reactor. 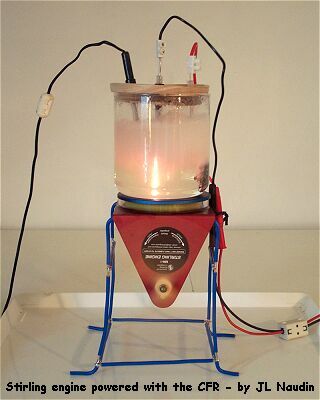 Let's say this power source is also virtually pollution-free, able to burn most fuels, and requires minimal maintenance. 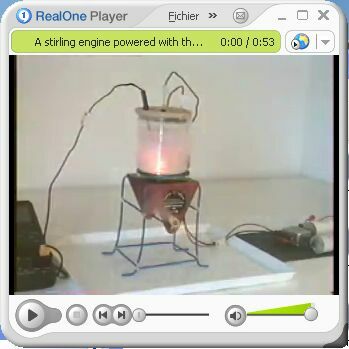 I used a Stirling Engine model from the American Stirling Company, the model is the "Stirling Engine MM-1". This experiment is very simple to conduct and anyone can do it. 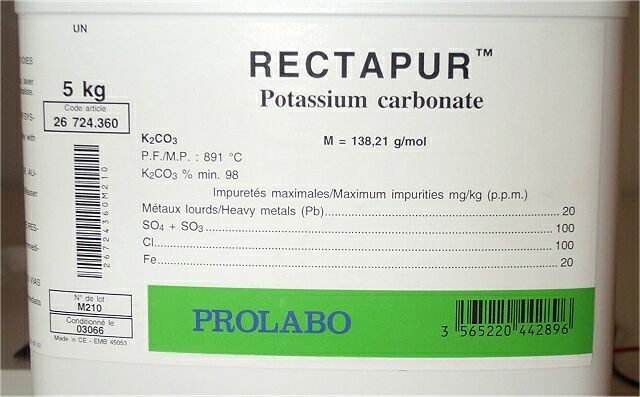 The Cold Fusion Reactor is composed of a 700 mL glass vessel filled with 600 mL of a Potassium Carbonate ( K2CO3 ) solution at 0.2M. The CFR is preheated to 77°C and then the power supply is switched on. 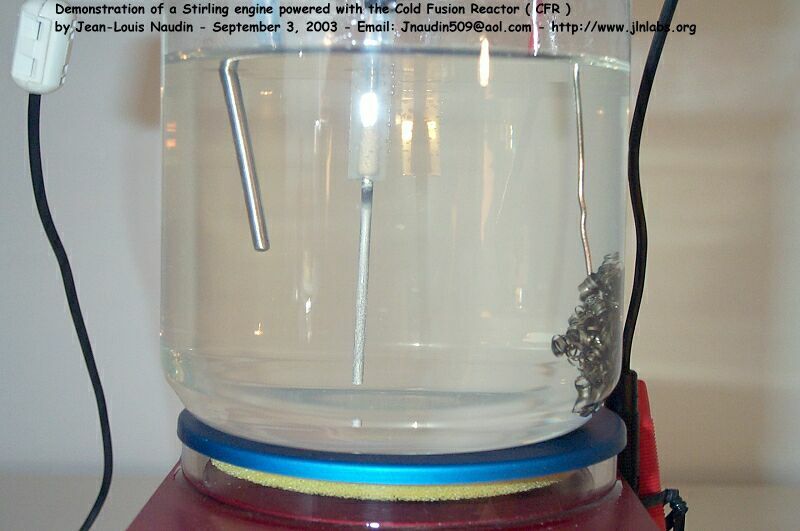 The Stirling engine turns quickly at up to 630 RPM by using the heat produced by the Cold Fusion Reactor. 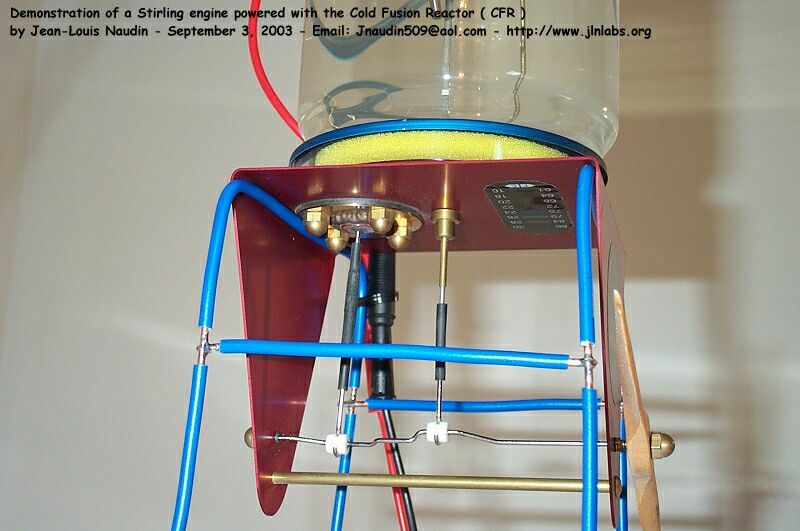 Notes from Jean-Louis Naudin : This is a proof of concept experiment, its purpose is to demonstrate that a simple Stirling engine is able to run very well with the heat produced by the CFR.